Sharpens all kinds of straight edge tools, such as anvil loppers, grass hooks, pruning knives-kitchen knives and pocket knives, too. Just place the guard over the cutting edge and draw the sharpener across the blade. 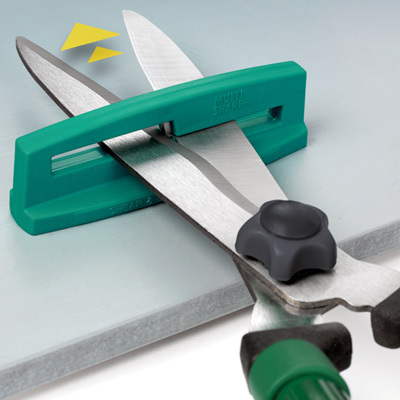 The diamond-honed tungsten carbide cutters quickly bring back a razor sharp edge. 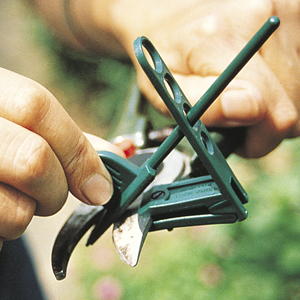 Sharpens accurately, regrinds the correct angle on all types of pruners, loppers and pruning knives. Silicon carbide sharpener. Fits any electric drill, so you can regrind rotary mower blades and garden tools. High quality aluminum oxide angled wheel produces sharp new cutting edges to the correct angle in minutes. Spades, hoes and edgers work twice as well, when they have a really sharp edge. Grinding wheel is 2" across. 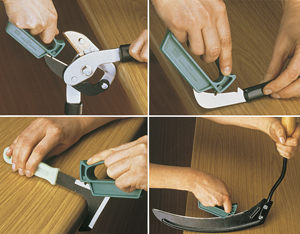 Resharpen all types of shears, edging shears and scissors. Tungsten carbide sharpener. Easily mounts on work bench, screws included.